At the packed, buzzing opening reception for the juried Annual Mazin Art Exhibit in the Patio Gallery on Sunday, November 22, many people paused and pondered in front of the first prize-winning piece, “Fusion.” The enigmatic earth-toned multimedia work shows four conical faces connected by threads to a large boulder-like item. The meaning behind “Fusion” was never revealed. 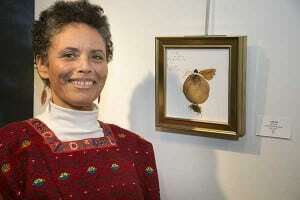 Its creator, Russie Wight-Waltman, wasn’t there to explain it because she was sick and not able to attend the show. The work’s puzzling quality was part of what made Mazin juror Luanne Rimel pick it as the winner of the first-place ribbon and $1,000. “There’s a lot of mystery in that piece,” Rimel said during the prize presentation. Rimel, a St. Louis-based textile artist and experienced juror, culled 129 Mazin submissions down to 29, and also chose the winners. Third place and $300 went to Alexander Taylor’s oil painting “Woodford Reserve Distillery.” Taylor said he hadn’t planned to paint the Distillery the day he visited it for the first time, but he was unexpectedly charmed and inspired by it. Vickie Wheatley’s bright textile piece “Las Ruinas” and Paul Reynolds’ bleach on paper piece “Wood,” both received honorable mentions. The winners reflected the wide variety of styles and media comprising the show. Other memorable and unconventional pieces include Craig Kaviar’s “Illumination,” an alluringly ancient- looking forged iron menorah; Barbara Tyson Moseley’s “Button,” a button-covered contemporary ethnic doll; and Kevin Schultz’s “Mermaid, a crochet lace sculpture of a female torso that looks like it is about to wiggle off the wall. 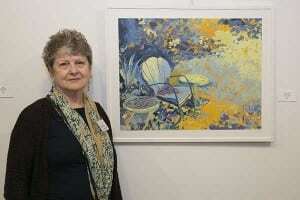 Patio Gallery Director and accomplished textile artist Bette Levy was beaming with pride as she kept busy mixing and mingling with the artists and gallery-goers. It was the perfect time and place for the tribute because so many of the artists and colleagues Levy has worked with over the years were there to share the moment. The Mazin Art Exhibit was created 10 years ago by Bernice and Benjamin Mazin, z”l, and is funded by the Mazin Visual Arts Fund. Judy Hummel, the Mazins’ daughter, was at the opening. She was grateful that the tradition her parents started is more popular and relevant than ever. The Mazin Annual Art Exhibition will remain in the Patio Gallery through December 29. LOUISVILLE, KY (Feb. 21, 2013) – Louisville’s neighborhoods, landmarks and surrounding rural areas are vividly portrayed in photos, paintings and dimensional art in a new exhibit on display at Louisville’s historic Metro Hall, Feb. 25 - June 8. * Rachel Seed’s photographs freeze scenes and locations in the Portland neighborhood. * Martin Rollins uses colored oil pastels to capture moments in time of neighborhoods including the Highlands, Clifton, Crescent Hill, Germantown and St Matthews. * Bette Levy’s old farm tools and hand-knitted embellishments express the history of her family and others in rural areas of Jefferson County and beyond. The exhibit is curated by Daniel Pfalzgraf, a multi-media artist and curator who has been exhibiting art professionally for over 14 years. He is currently director of The Green Building Gallery and also director of Media Services at B. Deemer Gallery in Louisville. The Rotunda Art Project series is produced in partnership with the Louisville Commission on Public Art, with assistance from the Louisville Visual Art Association. Visitors may see the exhibit anytime the building is open to the public, which is generally weekdays from 8 a.m. to 7:30 p.m. There is no charge to enter Metro Hall, but people are required to go through security and show a photo ID. Daniel Pfalzgraf is a multi-media artist and curator who has been exhibiting art professionally for over 14 years. He is currently the Director of The Green Building Gallery and the Director of Media Services at B. Deemer Gallery in Louisville. He was previously an assistant preparator at the Speed Art Museum and the Media Coordinator at Bill Lowe Gallery in Atlanta, GA. He has also worked as an independent curator creating exhibitions under the name of LoCAL.gallery. Pfalzgraf’s art is represented locally at Swanson Contemporary. His current series of work, “Blindly Following History” are blind contour drawings of portraits that are then painted in with oil paint and old, used motor oil. Pfalzgraf received a BFA from Murray State University (1999) in sculpture and drawing. He has exhibited in numerous group and solo exhibitions in Louisville and Atlanta. With the art and artists I selected to exhibit in Metro Hall, I wanted to examine places in and around Louisville filtered through time. From specific landmarks in the various neighborhoods of the city, to the rural surrounding areas, Bette Levy, Martin Rollins, and Rachel Seed all give us a second look at our day-to-day surroundings. Rachel Seed’s photos freeze the Portland neighborhood into a singular moment in time. Her attention to composition, to the color and textures of the area breathes new life into the old buildings and scenes that are often go unnoticed to as we travel from “point a” to “point b”. Through simple manipulation of colored oil pastels, Martin Rollins captures a real sense of precise moments of time in the neighborhoods of his drawings. You know when you see each work the exact the time of day, the temperature, and the feel and smells of the Highlands, Clifton, Crescent Hill, Germantown, and St. Matthews. His drawings don’t just reproduce the appearance of our city – they provoke emotional understanding of the community. Bette Levy’s use of old farm tools and hand-knitted embellishments reminds us of the importance of heritage, relationships and craft often associated with the rural life found further out in Jefferson County and beyond. Levy’s artwork elegantly expresses both her family’s personal history and the history of families all around the Metro area.